The Series of Automatic Bottle washing Machine (Tunnel Type) contain various models & Particular Model can be selected according to output requirement. Output speed is available from 60 bottles per minute to 300 bottles per minute. The Automatic Bottle washing Machine (Tunnel Type) can work with a variety of round bottle like Glass, PET and HDPE with minimum format parts. These models are equipped with 5 internal washes and 2 outside washes in order to guarantee e complete washing / cleaning. Internal washing done with various entities like Compressed Air, Re-circulated water & DM Water. Outside surface washing done with Re Circulated water & compressed Air. Machine Frame Structure Is Entirely AISI 304. Two Nos Of Emergency Switch Are Fitted At In Feed And Out Feed Side. Inbuilt 2 Nos AISI 316L Tanks & Pumps & Are Positioned Suitable For Easy Maintenance. All Electrical And Brought Out Items Are Of CE Certified. 30 Ml To 200 Ml Bottles Without Any Major Change Parts. 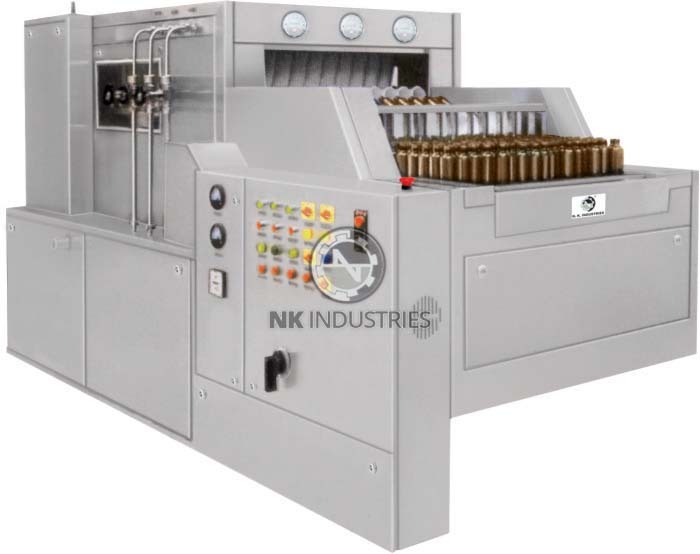 Can Accommodate Different Sizes Of Bottles With The Help Of Minimal Change Parts.